When it comes to apple pie, I firmly believe that you can’t beat a made-from-scratch pie. It’s fun to make and shape the crusts and you have total control of how sweet or tart your filling will be. The option of opening a can of prepackaged pie filling and pouring it into a frozen pie shell is not necessarily a bad one, however. I know that doing this allows you to fill your kitchen with the smell of freshly baked apple pie while saving some valuable holiday time for doing other things. 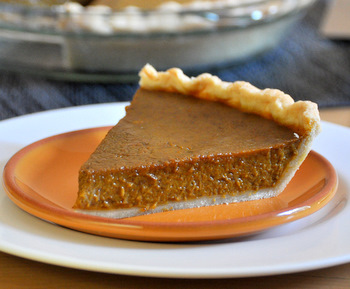 Plus, there are some good options out there for both premade pie crusts and pie fillings. 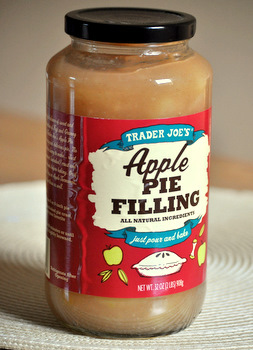 Trader Joe’s Apple Pie Filling is a new offering from TJ’s, introduced just for the holiday pie-baking season. The large jar holds 32 ounces, which should be enough for a generously filled apple pie, and it is made with the same all natural ingredients that you would probably put into your pie filling anyway. The filling tastes like, well, the filling of an apple pie! It has a good, fresh apple flavor and a mild mix of spices, so it actually reminds me a lot of apple cider. It has a good consistency, with plenty of large apple slices, so you won’t confuse it with chunky apple sauce even though it looks very similar while still in the jar. The apple slices are very tender and the filling surrounding them is smooth and sweet. Since I like my apple pies on the chunkier side, I probably will not be replacing my homemade fillings with this one when I’m making a full sized pie. If I did, I might chop up one fresh apple into thin slices and add it in for a little extra texture. I would definitely use it (and already have!) to fill up single serving pies baked in muffin tins or in my mini pie maker, as those smaller pies require fillings to be precooked anyway. 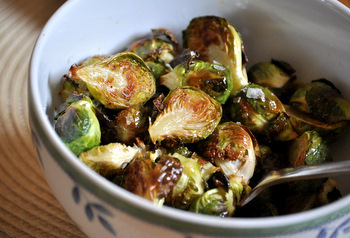 You can also use this as the base for an easy apple crisp or heat it up on the stovetop and serve it with vanilla ice cream. Using this to make a quick apple crisp sounds interesting. i may give this a try the next time. I’ll have to give this a try. I’m wary of trying things from Trader Joes (well prepared things, like their pasta sauce, macaroni and cheese). I’ve been let down so many times. And usually “canned” apple pie filling is weird tasting. But I’m willing to for go my 3 strikes rule for an apple pie. love this! i love trader joe’s products! i haven’t found one thing so far i don’t like! I just tried this and i am disappointed, i think its terrible; Sweet, spiceless and worst of all overly mushy. Its like buying apple sauce and adding equal amounts of sugar. I wanted it as a quick filling for pie pops and maybe ice cream but after tasting i am just going to make pie filling. Peel, core and chop apples sprinkle with lemon juice, sugar and cinnamon. Its a little work processing the apples but after tasting this stuff i will roll up my sleeves. I usually love trader joes products jarred artichoke spread is my fav.